Don't miss your chance to be a big winner. Last year's winner took home more than $1,800. A very nice cash infusion right before the holidays. Tickets now on sale from any HT Crew Club member. Or simply complete the form below to reserve your tickets. Last day to purchase tickets is December 1st. Tickets are $5 each and 5 for $20. Remember when you could spend hours just coloring. 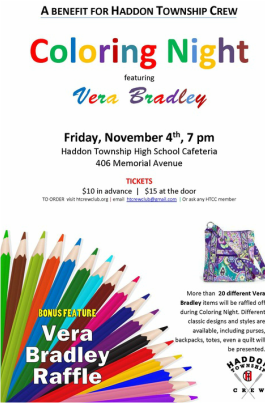 Those days are back at HTCC's Coloring Night with Vera where relaxation is the only goal. Along with beautiful Vera Bradley inspired designs, there will be yoga demos, free massages and delectable treats. For a little excitement - there will be a Vera Bradley raffle with dozens of unique items and stunning designs. Tickets $10 in advance $15 at the Door. Reserve your tickets below. Encourage friends and family to take a drive around Haddon Township on Saturday October 22nd. HT Crew is holding its annual Fall Coin Toss and we're hoping to raise lots of money so we can buy another boat!. HT Crew parents and rowers will be out with buckets and erg demonstrations and very enthusiastic Thank You's! for donors.